Pay only P 16,940 a Month for 12 months. Or pay only P 32,082 a Month for 6 months. The incredible versatility of the PowerEdge R730 server delivers outstanding functionality in just 2U of rack space. With the combination of powerful processors, large memory, fast storage options and GPU accelerator support, the R730 performs exceptionally well in a number of demanding environments. With the Intel® Xeon® processor E5-2600 v4 product family and up to 24 DIMMs of DDR4 RAM, the R730 has the processing cycles and threads and large memory footprint necessary to deliver more, larger and higher-performing virtual machines for data centers and cloud platforms. Highly scalable storage, with up to 16 x 12Gb SAS drives and the high-performance 12Gb PowerEdge RAID Controller (PERC9), can greatly accelerate data access for your virtualized environment. In addition, the R730 can take advantage of optional SanDisk® DAS Cache application acceleration technology for even faster data access. The option for up to two 300W dual-width accelerators/GPUs (choose from Intel® Xeon Phi™, NVIDIA® Tesla® and AMD FirePro™) supports environments that require processing acceleration, including graphics-intensive virtual desktop infrastructure (VDI) implementations, such as CAD/CAM and other research and development applications. Seven PCIe Gen3 expansion slots plus a dedicated slot for a RAID controller further enhance IO flexibility to help make the R730 an ideal compute node for IT as a service (XaaS) providers as well as high-performance computing (HPC) and medical-imaging solutions. Manage your data center servers the way you want: individually, collectively, in-person, remotely or with your smartphone — it’s your choice. Consistent administration and 3rd-party integration ensure seamless management of PowerEdge servers. Simplify administration of PowerEdge servers with the embedded intelligence of the integrated Dell Remote Access Controller (iDRAC) with Lifecycle Controller and with the robust, timesaving management features of the entire Dell OpenManage portfolio. Agent-free management from iDRAC8 with Lifecycle Controller offers real-time monitoring for the server and internal storage devices. It also monitors server health, multiple internal parameters and system performance without requiring agents to be installed in the server operating system — agents which could require additional upkeep and consume valuable CPU time. Zero-touch automated deployment discovers and auto-configures Dell servers by using configuration files stored in designated locations on an internal network, which can reduce setup time and manual entry errors. Administrators can simply rack, cable and walk away. Automated server updates synchronize servers to firmware baselines stored at designated locations on an internal network to simplify firmware updates. The Tech Support Report, automatically maintained by iDRAC, is a continuously updated health and status report that monitors over 5,000 key system parameters and can help cut time needed to identify and resolve server issues. 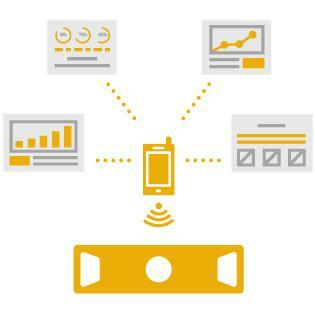 Administer systems from your smartphone, laptop or at the system with both local and remote management options. Use your smartphone with the OpenManage Mobile app to securely monitor remote systems, or connect to a server via Near Field Communications (NFC) to access a status report and logs using the iDRAC Quick Sync feature. Use a USB memory stick to upload configurations files for BIOS, iDRAC, PERC, LAN on motherboard (LOM) and network interface card (NIC) updates with the iDRAC Direct feature. Connect a laptop via USB to a specific server’s embedded iDRAC8 management-console interface for robust "at the system" management. 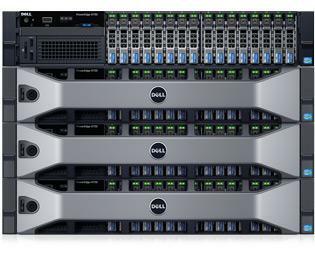 With high-performance processing, large memory capacity and innovative local storage options offering greater scalability throughout the portfolio, the latest generation of PowerEdge servers meets your needs today, with the hardware, headroom and simplified management to adapt as your workloads demand.